I have been following Katie Rodger’s blog, Paper Fashion since 2010. 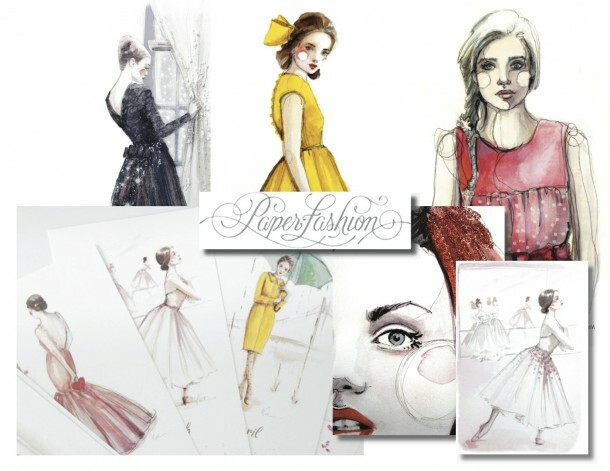 Her illustrations bring new life to fashion and the art of fashion illustration. Rodgers has a whimsical touch. Each project teems with life. Her signature hyperbolic rosy cheeks are my favorite detail. She adds depth, charm and nuance to faces and figures. Water and color form innocence on paper. Rodgers ability to animate parchment and paint is uncanny, and unparalleled. Her craft is a beautiful reminder of human ingenuity. PaperFashion leads me to a meditation on the simple grace of putting pen to paper. There is something uniquely human in hand writing – an art form lost on most in the twenty-first century. It’s a very personal artform. We write and our genes appear on the page. It is I who am crafting these letters, words, and sentences. Thousands of neurons fire and my fingers grasp a a shard of splintered oak fused with clay and graphite. I write who I am. Nothing more. Nothing less. Much the same way Rodgers illustrates her beautifully dressed figures, my handwriting tells a story. What hidden meanings lie beneath the written word? What can you tell about Katie from her nimbly sculpted illustrations? Writing in pencil grants one room for erasures and second guesses that might have been overlooked the first time round. I try my best not to erase. I try my best to write and to live every letter and word, moment and memory, with all of my heart. Writing with pencil and paper, I hold on to the idea that each letter I craft is an reflection of who I am. Each letter carries the weight of my being, and the promise of who I’ll become in the future.